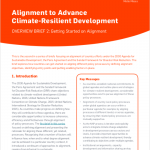 This is the second in a series of briefs by the NAP Global Network and GIZ focusing on alignment of country efforts under the 2030 Agenda for Sustainable Development, the Paris Agreement and the Sendai Framework for Disaster Risk Reduction. The brief explores how the different agendas and policy processes relate to each other and to a country’s national development planning processes. It describes the enabling factors for alignment and discusses how alignment objectives can be defined. Further, the brief outlines key questions that can help to identify entry points for alignment, recognizing that different approaches to alignment may be relevant and feasible in specific contexts and at particular points in time. As countries establish national commitments to global agendas and outline plans and strategies for climate-resilient development, considerable opportunities exist to pursue alignment of these policy processes. Alignment of country-level policy processes under global agendas can occur within a particular agenda (for example, by aligning processes at different levels) or across agendas, by ensuring that related policy processes are mutually supportive. As the NAP process is iterative and explicitly aims to integrate climate change adaptation in development processes across sectors and levels, it provides important opportunities to advance climate-resilient development, thereby contributing to objectives under multiple agendas. Institutional arrangements, capacity development and information sharing are key enablers for alignment.